Designed for application on High pressure fuel pumps (HPFP), Common rail systems, Pump injectors of diesel engines with the working volume no less than 5 L.
Lubricant Composition Atomium HPFP is designed for the treatment of High pressure fuel pumps (HPFP), Common rail systems, Pump injectors of diesel engines with the working volume no less than 5 L.
The treatment to be made in 2 stages. For the treatment use calculation in running hours (moto-hours): for generators and other stationary equipment 1 running hour = 50 km of run, for wheel tractors (and equipment) 1 running hour = 10 km of run, for a caterpillar special equipment 1 running hour = 5 km of run. The 1st stage: Pour Lubricant Composition Atomium HPFP in a full fuel tank (but no more than 50-55 liters of diesel fuel in a tank) at the rate of 1 ml of the lubricant on 1 L of diesel fuel. Drive till complete fuel depletion in the fuel reservoir (before the indicator shows the minimum fuel rest). Make refueling without adding Atomium HPFP, then run 2000-3000 km till the 2nd stage. The 2nd stage: Pour Atomium HPFP in a full fuel tank (but no more than 50-55 liters of diesel fuel in a tank) at the rate of 1 ml of Suprotec on 1 L of diesel fuel. Drive till complete fuel depletion in the fuel reservoir (before the indicator shows the minimum fuel rest). Then make regular refueling. Before applying Atomium HPFP shake the can thoroughly until natural sediments (active components) are totally dissolved. After applying Atomium HPFP drive the vehicle for no less than 20 minutes in any mode (regular operation). It is recommended to carry out Atomium treatment of the fuel systems together with engine processing at the same time or sequentially. It is not recommended to apply the lubricant at existence of mechanical breakages of diesel injectors (the belts of injectors cannot be restored). 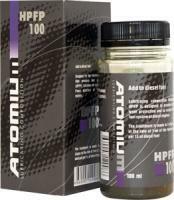 Atomium HPFP is compatible to any type of diesel fuel. To provide optimal level of technical condition of the fuel system it is recommended to apply Atomium HPFP every 30 000 - 40 000 km of run.